Yes, the final episode has finally arrived after a long drug out birth secret that was horribly kept, another unnecessary birth secret, and some little unnecessary plot twists. While the first 9 episodes showed promise, the next 21 were horribly done and very badly written. When we entered the 30s, the show did start redeeming itself, and while it was too little too late, it did end on a more promising note than I originally thought it would. I do have to say, though, I don’t buy Kang San and Hae Joo as a couple. There really doesn’t seem to be much chemistry at all between the actors. That being said, a happy ending for everyone all around. It’s really great as it talks about darkness and trying to find the right path in this world. Don’t you think it fits all the characters who fought with darkness or embraced it in this series? Jang, of course, cannot believe Hae Joo is really his daughter. Geum Hee tells him to confirm it with Dr. Lee and screams at him to go out. Jang shakily leaves and Hae Joo collapses to the floor in tears. I must say…these emotional scenes of hers are still not believable even to the bitter end. Yang Mi Kyung’s collapsing in sobs was much more believable. Hae Joo isn’t happy she told Jang the truth, but Geum Hee believes it was necessary as the truth would only make Jang suffer like he deserved. Geum Hee then rushes to the hospital where In Hwa tells her Jang went crazy and nearly killed Chang Hee and Gi Cheol. Geum Hee confirms her husband is definitely not in his right mind. The doctor then comes out and tells them that Gi Cheol will live, but he will be in a wheelchair for the rest of his life. At the same time, Jang confirms with Dr. Lee that Hae Joo is really his daughter. He collapses outside the office and laughs. How can this be? Chang Hee asks In Hwa for a divorce. He only married her out of revenge and now that he has finally achieved that revenge, he no longer has any use for him. In Hwa begs not to be cast aside, but Chang Hee pleads for freedom. It’s about time he finally escaped out of the darkness of the Jang family. He wishes In Hwa only the best and prays she meets someone much better than he. He walks away leaving In Hwa crying. Meanwhile, Jung Woo visits Gi Cheol. He knows everything now. I guess he no longer harbors such ill feelings against the older man as he’s realized how much Gi Cheol and Chang Hee have suffered. Chang Hee comes in as his father is crying for his sins that are unforgiveable. 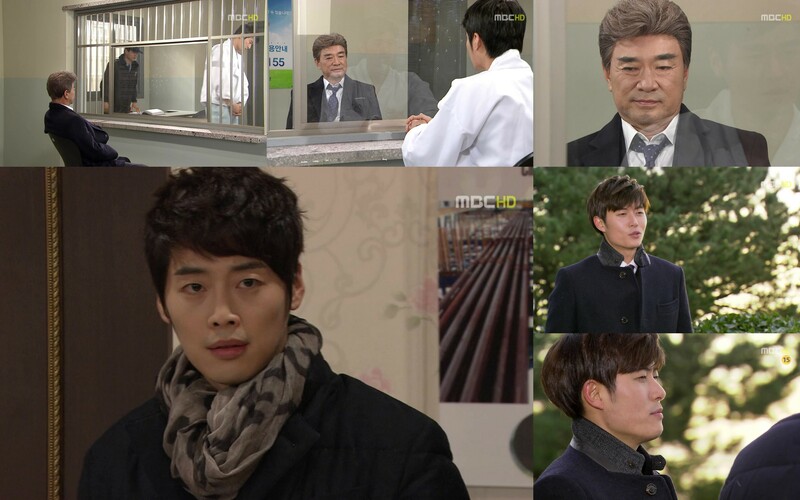 Jung Woo asks to speak to him and asks if it was Chang Hee who gave them all the information. Chang Hee confirms this. Jung Woo cannot believe the young man played Jang’s dog just to bring him down. I know, right? There was a way to destroy Jang without going completely evil. Jang goes to the shipyard with the microfilm before going to the factory. He commends Hae Joo and San for building a drill in such a small factory. He then reveals that he knows now Hae Joo is his daughter and he wishes a partnership. Count this as Jang’s last desperate attempt to achieve his dream. Neither Hae Joo or San want anything to do with him. San reminds him that he killed both his and Hae Joo’s parents. Jang says it was a car accident that killed San’s parents while he didn’t kill Hae Joo’s father since he is Hae Joo’s father. Hae Joo denounces him as her father. She has two and he is not included. Jang takes back the microfilm and leaves. In Hwa reveals to Geum Hee that Chang Hee wants a divorce. Is it because of the recent assault? No, it was Jang’s years of abuse. In Hwa cries and says she really loved Chang Hee as her heart is breaking now. Geum Hee promises to talk to him. Just let him go. If it’s meant to be, he’ll come back. In contrast to this dour scene, we get the Chun family laughing at Sang Tae’s expense. Young Joo used him as a guinea pig since she has a practical test coming up for beauty school. We also get what I’ve been waiting and waiting for (not the main couple getting together, but Imo and samchoon!). Jung Woo officially proposes to Bong Hee at a romantic dinner. She is reluctant to believe it’s real, but when he gives her a peck on the mouth, she knows all of her hard work has finally paid off. Jang recalls when Hae Joo was a child and expressed her dreams about building a drill ship. He smiles. Looks like he’s finally realizing why he always thought she was just like him—even their dreams were the same. The next day the news breaks and Chang Hee holds a press conference to reveal Jang’s evil deeds. In it, Gi Cheol gives Hae Joo a tear filled apology from his hospital room. Hae Joo can only cry herself. Should Gi Cheol really be forgiven? He was Jang’s puppet, but he also did a lot on his own. His character was a bit one for inconsistency. There are times you wanted to feel sorry for him and believe he really did regret his actions, but the next moment it was really hard to believe. After the conference, Jung Woo calls up Jang who promises to go to the office himself after asking for a bit more time. Jung Woo does grant him this. The first thing Jang does is visit In Hwa. She wants nothing to do with her father. Not only did he destroy all these other people’s lives, he destroyed his daughter’s happiness. Jang is not happy to learn how much In Hwa is suffering right now. Of course, In Hwa, again, disowns him. At this time, her husband meets with Hae Joo. He gives her everything that Jang had stolen from her and San (minus the film). Hae Joo doesn’t want to take it, but Chang Hee reminds her that is also San’s inheritance from Haepoong so she should talk to her partner before outright rejecting it. Hae Joo is also very apologetic for not trusting in Chang Hee. Chang Hee smiles, he did a lot of bad things so it’s no wonder that Hae Joo was angry and cold towards the end. Their friendship is now back on the mend. I find it interesting that Chang Hee said that taking over the shipyard was never really his dream. Then what dream does that boy have? Truthfully, given his downtrodden life, he never really had a dream like the always optimistic Hae Joo had. He only had a desire for revenge. His only dream now is to leave behind his dark past and find his own light. Jang’s next stop is to see Il Moon. His son is wearing the jacket Jang sent. Il Moon, however, wants nothing to do with his father. He even requests that Jang use his influence to go to a different prison as Il Moon can’t take being beaten by Jang there. Jang is surprised by Il Moon’s reaction—why? Doesn’t he know how shabbily he treated his son? Before Il Moon turns his back on him, Jang does request that Il Moon accept Geum Hee and look after her. This, of course, upsets the younger man. Meanwhile, Hae Joo reports back to San who doesn’t seem all that happy with Chang Hee’s gift. At Cheonji, Chang Hee is packing up and Jo and Yang ask who the new president will be. Chang Hee assures them it’s a good person who they know well. Enter San who asks to talk to him. They step outside and San punches his friend again. Can returning what was stolen really make things okay? Chang Hee slugs San back and calls him an idiot for not understanding that to lie to your enemy, you first need to lie to your friends. This has the two boys wrestling and laughing. Their friendship has finally mended. San does request that Chang Hee stay on, but Chang Hee says Ulsan and Cheonji is a place where he cannot breathe. He looks out over the shipyard and says it’s a scene that makes the eyes smart and vision blur. Jang’s final stop is to meet with Geum Hee. He reveals that he will probably be going to jail for a long time and wants to see her face one last time. Geum Hee says that since this was his own doing, she will not visit. Jang didn’t expect her to. He then requests she look after their children that she raised for 27 years. Even the rascal Il Moon who has done much wrong to her. Jang also reveals how proud he is to have a daughter like Hae Joo. She is everything that he had wanted Il Moon to be. He goes to leave and Geum Hee gets up crying. She says something about after he gets out, but she can’t finish the sentence through her tears. I think this makes Jang somewhat happy as he leaves.a He goes to the overlook where Kang always used to go and recalls his one conversation where Kang warned him that doing things his way will only cause him pain and regret in the end. Jang yells his own name before collapsing on the ground laughing and crying. Regret? I’m sure he does. We then cut to the next day with a sickeningly cute Hae Joo acting all lovey dovey with San. It’s such a new occurrence that it really shocks San. I won’t lie, I actually did not like this scene. Sure, it was cutesy, but to me it just seemed wholly unbelievable for some reason. Of course, Hae Joo vows to show her real feelings now and promises to never leave San’s side. Kudos, his longtime love and patience has paid off. The two return to their office where Assistant Kim has a package for Hae Joo (he calls her the boss—how cute). Hae Joo opens it. Inside is the microfilm and a letter from Jang. He talks about how in his day, doing what he did didn’t matter as long as you had power, that made up for all of your misdeeds. It was a different time and people did kill one another to survive in that era of poverty. He does say that he should never have started out on such a wrong path. He then says that the only thing he can do now is step out of the way of his daughter who defeated him with her own way—her intelligence and brightness. She took a higher road than he did even though their beginnings were similar—both lived in poverty with people looking down on them. He will now leave. Hae Joo rushes to the shipyard and catches Jang just before he leaps. She begs him not to give up and asks him to help her on the side. She even calls him “father.” This makes Jang choke up. He’s happy and thankful that she could grant him this at the end. He then jumps. Hae Joo collapses and cries. You know…there was a chance that she could have gotten help and saved him, but no, she just sits and cries and watches the water where he sank. I think it’s a fitting end for him, but I’m just saying, there was a chance to try to save him. Now just think about it—he’s killed all of her father’s now. Her first adoptive father Yoon Hak Soo he murdered himself, he caused Gi Cheol to kill her second adoptive father, and now he’s taken his own life. Good job. This girl will be traumatized for life. A year passes. The drill ship is built. Dal Soon reminds San that he cannot give up on Hae Joo now that he’s become successful. San, of course, states that will never happen. Bong Hee is pregnant and close to her delivery date. She brings Jung Woo food which, of course, tastes badly. Jung Woo quickly gets her to her feet to go out for lunch when poor Yi Soo comes in and her meal is foisted off on him. He looks so pathetic as the door closes and he asks if he has to eat that stuff again. Poor Bong Hee. She does try. Meanwhile, Geum Hee prepares a feast for Il Moon’s release. It looks like their relationship has finally gone back to normal at long last over that year. Good. Il Moon has a chance at being a decent person. Chang Hee is working in a small village as a lawyer. Most of his clients can’t afford to pay him, so they give him livestock and produce. He takes back a chicken—yet another one to raise. He calls out for his father but receives no answer. Where did he go? He turns and there is In Hwa pushing his father around in his wheelchair. Chang Hee wanted her to live a better life without him, but she just can’t forget him no matter how hard she tries. Thus, if he doesn’t accept her back, she’ll end her life there. Eyeroll. But hey, after all their lovey dovey scenes our tertiary couple comes to a satisfactory end. The drill ship is named the May Queen. Hae Joo is happy to have kept her promise to her father (Hong Chul). She and San go out for their first oil drilling expedition. San shows her plans for a new drill ship to drill in the arctic. Hae Joo happily agrees to help him with this latest project, He then takes out a ring and proposes to her. He wants to have lots of babies and a warm, loving family—something he didn’t have growing up. Hae Joo teases that they can’t build the new ship and have tons of children. San then says they’ll have to scrap the ship for the children then. LOL. More than money, he wishes to leave his children a legacy of love and dreams. It was a better end than expected. It really was. I am SO glad May Queen is officially over. I don’t know how I made it through the middle 20 episodes. Wow. For anybody who stuck around—hope you enjoyed the shipwreck with me. Yes, thank God it’s over! I have a question, though: Did Jang survive? In the scene between the mother and Il Moon, she said something about going to “see the father”? Who is she referring to? I took it as visiting Jang’s grave since he died when Il Moon was still serving time, so he hasn’t been able to pay his respects yet. i just want to ask. the only people who knows everything about HJ are KS , GH, and Uncle JW right? CH, IH, BH, and II Moon doesn’t know she was JDH daughter. Thanks good its over now. Im stuck in the middle. thanks for all the recap.. i really enjoyed your side comments in this series. Thank you for your recaps! To keep recapping such a crappy drama – I’m impressed!!! Just a short amount of time to read your reviews. That whole “let’s be friends again”… no consolation at all. Yes, since the 30th epsiode they sped up the dragging story. And like you stated – too little too late. Loved Jae Hee's smiles in this episode, The chemistry between HJ and KS was soo bad. I don't really understand how dating works in Korea, but the leads are over 30 – or around 30 right? I don't get why their response to kissing is so naive — you know that shocked stare thing they do. Maybe this was a prime time drama? … I had the same thought when Jang decided to throw himself off the platform – the 3rd dad she's lost because of his actions. Anyway, I appreciate all your hard work. Take care!! The whole drama was lacking confidence in their action.. The only reason I stuck around was the the kids that started the drama. I thought it was going to be the same w/ “The Moon Embraces the Sun”. The ending was so..so, not what I expected, but alright!!?? silent reader here! thanks a tonne for recapping this series, not gonna lie the first 8 eps were primo, the next few I held out hope that it was gonna get better and then…TT TT decided to soldier on despite the epic sinking may queen (via recaps of course) … hur… Im relieved this drama is over, my OCD’ness compelled me to actually finish this horrendous drama despite it sucking on all major levels, like you said there were 3 redeeming qualities, and non of it attributes it to the quality of writing and shocking plot.. Kim Jae Won, Jae hee & Lee Hoon – wash your hands of this drama you fine men and make mental notes to never work with this writer and lead actress again lol. yes im a tad irritated, more at my self to sticking with it, but thankyou for the recaps! just reading about the last 10 recaps hurt can’t imagane what watching AND recapping felt like hehehehe… you are a legend! Ah, yes. It was a horrible drama pretty much from episodes 9-30. After 30 it got slightly more tolerable, but those last minute plot twists thrown in due to the extension…meh. There were times I really wanted to drop this drama and I think my recaps may or may not of suffered have I was constantly whining and character bashing (to the disturbance of some recap readers apparently). I soldiered through on my loves for Jae Hee, Kim Jae Won, and Lee Hoon. I soldiered on through my desire to NOT drop dramas I recap no matter how much I start to hate them. Although, I’m not sure I could survive another May Queen. Actually, this drama season saw me recapping 3 dramas I was tempted to drop: Bachelor’s Vegetable Store, Love Forward, and May Queen. Compared to May Queen, the other two dramas were fantastically awesome. I really love the couple lee hoon and kim ji young…. I always wait for their appearances although some of their cute scenes were just lil i hope they got a lot of exposures… Esp whenever kim ji young hit or punched lee hoon. Ah, that couple = LOVE!!!! They are one of the reasons I made it to the end of this shipwreck. I would love to see another drama with them as a couple in it. I soo love them so much imo and sanchoom… They have a good chemistry more than the mai characters…. And coz of that i got a crush on sanchoom… Thanks for the recap i even saved all your clips on my ipad and their pics… Esp imo and sanchoom… Thanks! Oh yeah, major crush on Lee Hoon from this drama. Sigh. Want to see more of samchoon. Preferably not as a bad guy like in Full House Take 2. I’m glad you enjoyed the recaps and all the pics! Yeah major crush… Your most welcome…. Yay so glad that HJ and KS ended up together instead of returning to CH! Me, too. They really did suit each other a lot better than jh & our prosecutor. It was such a disappointment after the first seven episodes with a relatively great younger cast. Jae Hee is a great actor, but his character fell flat here 😦 But yep, kudos for cast and crew and anybody who made it through the entire shipwreck! What an outstanding movie with conc heart cleansing message, thanks to the directors, producer, features, et all. Here in Uganda East Africa we couldn’t blink eye, Asanti Saava.